What you need to know to protect your eyes. IF you have Atopic dermatitis / Eczema – a misleading idea is to think that cataracts only affects older persons. Cataracts is the clouding of the eye’s natural lens between the iris and pupil and can cause blindness. Studies show that people that suffer with mild to moderate Atopic dermatitis (eczema) have a higher 25-50% occurrence and accelerated rate among ages 18-50 years old. Whereas the general population around the world usually reflects a prevalence of cataracts as we age after turning 40 years old. According to the National Eye Institute, “Cataracts are sometimes linked to steroid use.” However, there seems to be contradicting information and clinical studies proving / disproving the exact relationship with corticosteroid use both systemically or topically in relation to the accelerated progression of cataracts when Atopic dermatitis is or has been present. Strangely enough, the presence of cataracts was NOT limited to those with just facial eczema, but rather cataracts had potential to develop even when the eczema was anywhere on body, and not just on / near face and eyes. The mere diagnosis of Atopic dermatitis is enough to justify setting the alarm clocks on more frequent Opthalmologist visits. In fact, it is recommended to set up QUARTERLY OPTHAMOLOGY VISITS EVERY 3 MONTHS because of the potential of sudden and accelerated cataracts especially when the eczema condition exacerbates. Keep a health diary of symptoms and medications, especially when taking any form of corticosteroids. 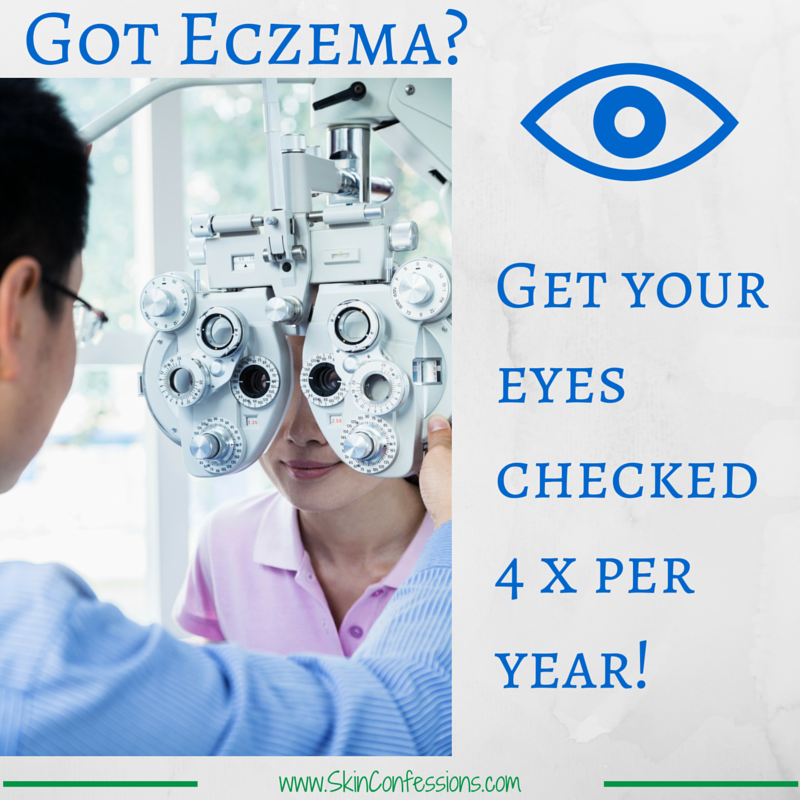 Stay tuned for more info on Glaucoma and Eczema in my next article. HINT: Topical Steroids is shown to have direct relationship in the development of Glaucoma!